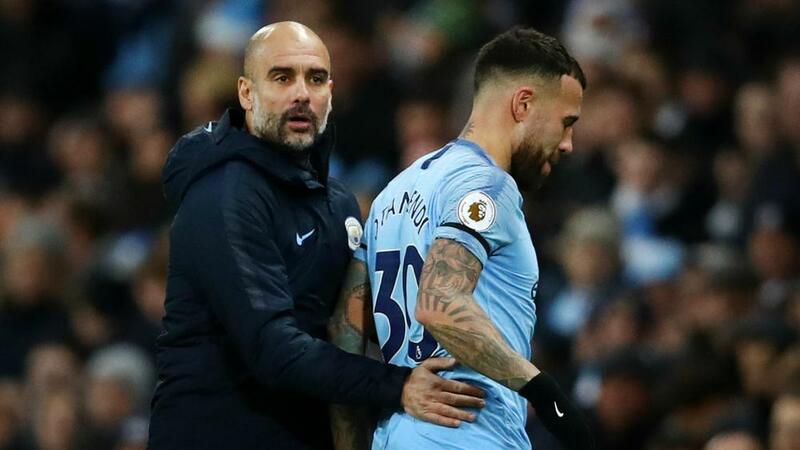 "He's not happy - I don't have an answer," Guardiola told reporters at a news conference. "When he plays he's happy, when he doesn't he's not happy. I don't know what I can do. When he doesn't play he's not happy. "He could play every week, he can play and I know he's there. He can help us in the build up, I've got three central defenders and Vinny [Kompany] as well. He played [against] Southampton and was excellent, sometimes I have to decide one or the other. "John came back well after the World Cup, he wants to play a lot of games. Nico - I know we can count on him, an incredible professional and always he's ready. I can understand it." "It depends on the players, I don't want sad players here," he added. "If you are not happy you knock on Txiki's door. "At the end of the season they have to reflect. If they don't play and are not happy they have to move. I know they are able to do it and I don't have any complaints about that. "You see the schedule, the games everyone plays. Except the last game, [Fabian] Delph three games suspended, the others play, there's not one guy with more than two or three games with not playing. "There is not one who is not playing games and it didn't happen. Selection is the hardest part, I am honest, in my job, you look at what happens, some need extra games for the confidence, it's many reasons, not just being naive selection."